A stunning photo of a centipede millirobot by Wyss core faculty member Rob Wood and graduate student Katie Hoffman received an honorable mention in the 2010 AAAS International Science and Engineering Visualization Challenge. The annual Visualization Challenge was created by the journal Science and the U.S. National Science Foundation to engage people from around the globe in conveying science in novel and visually stimulating ways. The competition builds on the premise that illustrations provide the most immediate and influential connection between scientists and other citizens and represent the best hope for nurturing popular interest. Hoffman and Wood’s photo is of a 12-legged, segmented robot based on the body morphology of a centipede. From the top view, one sees the actuators that control each leg, while the reflection shows the flexible connections between the segments, and the penny establishes the robot’s size. 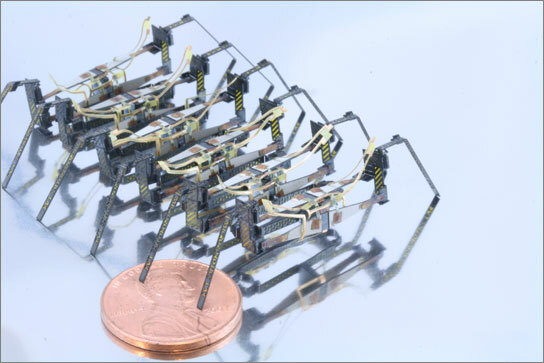 The centipede millirobot is just one project in Wood’s lab that looks to insects for inspiration. Wood is also leading a team of over 40 researchers on project to develop coordinated colonies of autonomous robotic bees that might one day perform important tasks, such as search and rescue, hazardous environmental explorations, and pollination. Winners in the Visualization Challenge’s five categories (Photography, Illustrations, Informational Posters and Graphics, Interactives Games, and Non-Interactive Media) appear in a special section in Science and Science Online, and on the NSF website.